To make this drunken prawns dish is very straightforward without any fuss at all. All the flavours are absorbed by the tender prawn meats. 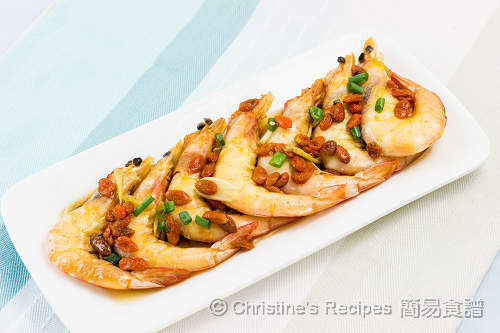 Drunken prawns are very popular in Chinese cuisine just like drunken chicken dishes. Often times, the drunken prawn dish is steamed. I was itching to try new cooking method of making a prawn dish to celebrate the coming Chinese New Year. 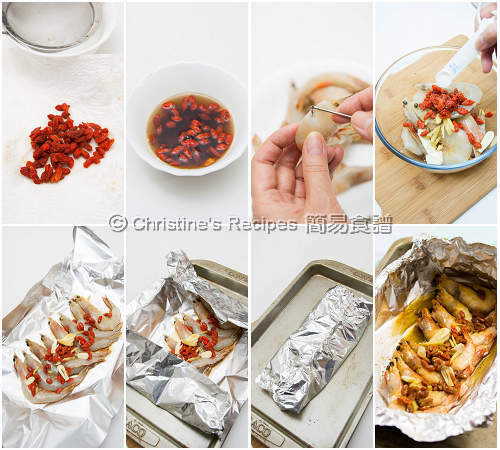 I prepared all the ingredients just like making steamed drunken prawns, but wrapped them into a foil parcel and baked in oven. After running the test, I was very pleased with the end result. The prawn meat was tender, just cooked with the nutritious goji that’s absorbed all the flavours after baking. You might be busy around with making all kinds of CNY cakes or snacks. 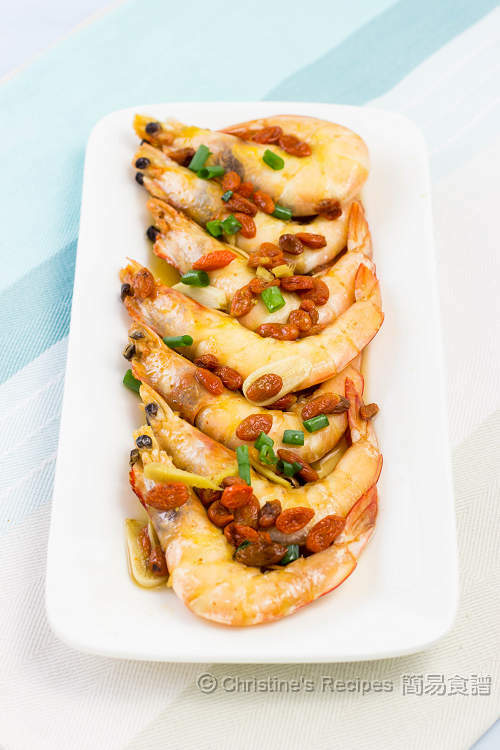 This simple and quick prawn dish is absolutely perfect to be put on your CNY cooking list. Having said that, this dish is one of my family's favourite dishes throughout the year. Hope you all like it as much as we do. Devein the prawns. Trim the head and legs if you like. Rinse and wipe dry. Set aside. Rinse goji and wipe dry. Soak in the wine for 10 minutes. Put the prawns into a large mixing bowl. Mix in the goji with wine and other ingredients. Combine well. Use foil to wrap all the ingredients well. Bake in the preheated oven for about 8 to 10 minutes. Serve immediately. The baking time depends on the size of the prawns. Please adjust accordingly. By all means, don’t over cook them. The Goji will absorb all the flavours. Enjoy with prawn meat. Can't even remember when I last time had some drunken prawns...I miss them. may i know if i can use beer instead of the shaoxing wine? thank you! We made this dish during my family's grandma day (labor day in Canada). Delicious! We have one is your cookbooks; I love your recipes because I can make Chinese food but still get the kids involved! Thank you!